“There is nothing new under the sun” is a refrain that is just as true for public policy as life. Serious debates over socialized medicine or single-payer healthcare have occurred in this country since at least the New Deal era. Harry Truman tried to foist a single-payer health system right after World War II but was rebuffed by Congress. Other attempts to nationalize America’s healthcare industry have faced swift rejection. However, even in the wake of Obamacare, a new crop of leaders friendlier to socialism are gearing up for another universal single-payer fight. Despite around 170 million Americans having private health insurance, most through cost-sharing from their employer, presidential candidates and U.S. Senators like Kamala Harris, Bernie Sanders, and Kirsten Gillibrand have called for its abolishment. “Let’s eliminate all that,” said Harris. Gillibrand, once known for her centrist views, called abolishment an “an urgent goal.” Sanders simply dismissed private insurance saying “that’s gone” under his plan. In the U.S. House, over 100 Democrats have signed on in support of a “Medicare for All” plan. Rep. Alma Adams, Rep. G.K. Butterfield, and Rep. David Price are the U.S. House members from North Carolina that co-sponsored the legislation. This despite 71 percent of Americans saying they are satisfied with their employer-sponsored plans. Imagine the consequences of all that central planning and the price controls for a sector of the economy that is 18 percent of our GDP. Included in those numbers holding private insurance are millions upon millions of lower-and middle-class Americans, and millions with preexisting conditions or chronic diseases. They rely heavily on private insurance for affordable and specialized treatment independent of rationed care and government mandates. As healthcare has become costlier, more complex, and more bureaucratic, politicians are prone to offer up the only solutions they understand: more government which only serves to exacerbate the problem. Thus most politicians are unable to alleviate the main concern to consumers, which are rising costs. The cost of a Medicare for all single-payer system is estimated by some at $32 trillion over the next decade and would require a whopping 60 percent increase in the federal budget. These numbers are simply unrealistic given a $22 trillion debt and $153 trillion in projected unfunded federal liabilities by 2023. 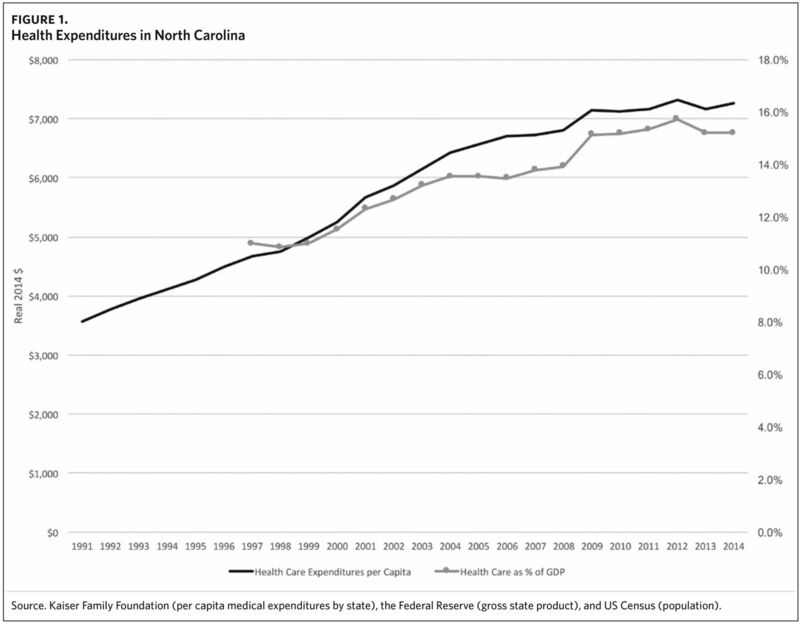 Expansion of Medicare alone under Obamacare, a hotly debated topic in North Carolina again, is already a drag on state budgets and exacerbating Washington’s spending crisis. More detrimental than the cost to taxpayers though would be the rapid depreciation in the quality of care and the overall threat to our hospitals and the entire medical system. Medicare and Medicaid typically reimburse hospitals for services at rates below the hospitals’ cost of providing care. In other words, hospitals suffer a loss for treating Medicare and Medicaid patients. Payments for those programs shortchanged hospitals by a combined $76.8 billion in 2017. The shortfall for Medicare alone was $53.9 billion. When it comes to Medicare, hospitals received a payment of only 87 cents for every dollar they spent caring for patients under that government program in 2017. With private insurance crowded out or eliminated altogether, hospitals would have to dramatically cut back on services or close altogether without private insurance subsidizing those government payments. It doesn’t stand to reason that hospitals and treatment facilities can afford to offer up the same standard of care while losing money on every patient in America. Will Americans be up to support the closure of hospitals and medical facilities in return for a universal insurance card and dramatically higher taxes? A government-controlled system with bureaucratic price controls, rationing and declining quality of care will only end in misery for the vast majority of Americans. But the political Left has continually signaled that a single-payer system is the ultimate goal. And with many younger Americans warming up to socialism and with the populace embracing an ever-broader definition of rights, a monumental battle on healthcare is looming again in Washington. Thomas Jefferson noted, “that the natural progress of things is for liberty to yield, and government to gain ground.” Let’s hope Americans understand the stakes because they are the best and ultimate guarantee of liberty against another big-government onslaught to take over our current healthcare system, that while far from perfect, is superior to the scourge of single-payer.